Hollybeary Creations : Love like crazy!!! 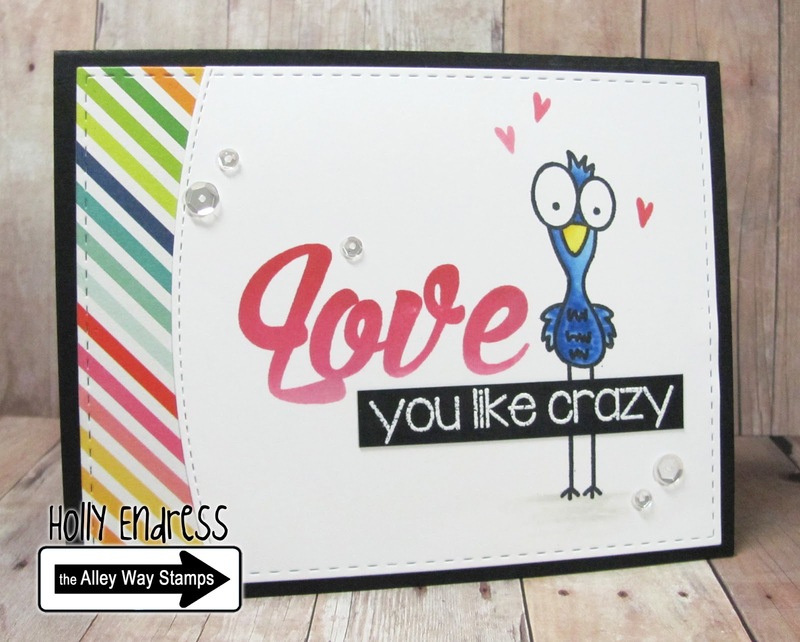 Happy Wednesday everyone... Today I have a super cute card featuring some of the newest sets from the Alley Way Stamps. Big Time & Flap Happy.. I paired them up with a few others sets as well. I stamped the sentiment from Big Time onto a piece of White card stock using some Ombre' Ink from Hero Arts. 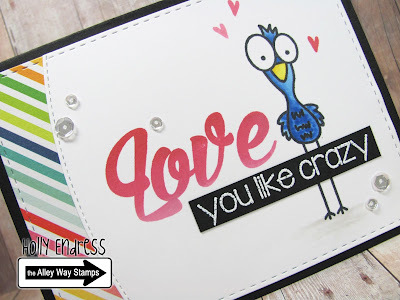 Then I stamped the bird rom Flap Happy and colored it in with Copics. I added a few little Hearts from the Tootharina set. I stamped the smaller sentiment from Yappy onto a piece of Black card stock and heat embossed it in white and trimmed it out. I die cut the panel with a stitched rectangle die and die cut the curve as well. I added a piece of pattern paper behind it and then adhered the panel to a Black Card base. For a bit of sparkle I added a few sequins from Pretty Pink Posh in Sparkling Clear. I love how this came out it's so cute!! Head over to the Alley Way Stamps Blog for more great inspiration!